It’s hard to believe – Protopage is now 10 years old! We launched way back in 2005, and became the most bookmarked web site in the world for several days running (as tracked by “Delicious”). We were also featured in one of the first ever posts written on a brand new “Web 2.0” blog called TechCrunch.com! Universal headline import – You can now import news headlines from almost any web site. Previously, we only supported sites that used a technology called ‘RSS’. However, we’ve upgraded Protopage with a kind of ‘artificial intelligence’ that can now automatically detect and bring you headlines from almost any web site. News feed search engine – Our new search feature means you no longer need to know the URL of the web site from which you would like to receive news headlines. Our new search box will do the work of searching the web and finding relevant news feed widgets for you. (Access the search from the ‘Add widgets’ button at the top of your Protopage). 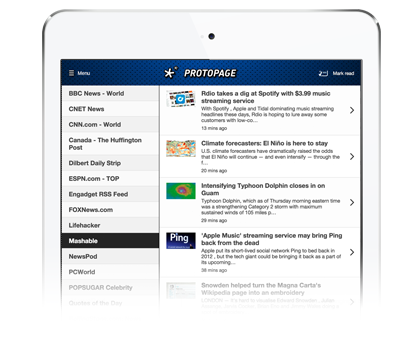 Protopage for iPad – We’ve developed a special iPad/tablet version of Protopage that will bring you all of your news feeds and podcasts in a much nicer interface tailored specifically for tablets. Access it by going to protopage.com/tablet from your iPad. Protopage mobile improvements – we’ve spruced up the browsing experience for the smartphone version of Protopage (access it on your smartphone at protopage.com/mobile). Full HTML5 compatibility – no more Adobe Flash required. This includes a new podcast player with 15 second audio skipping so that you can easily rewind and skip through longer podcasts. Custom wallpaper upload – You can now directly upload photos from your computer to use as your Protopage background wallpaper. Access this feature by clicking the Colors/Settings button at the top of your Protopage. Bookmarks A-Z sort – For those of you with large numbers of bookmarks, we have a new ‘sort’ feature accessible from the ‘edit’ menu of your bookmarks widgets. This entry was posted on Tuesday, August 11th, 2015 at 3:10 am	and is filed under new features. You can follow any responses to this entry through the RSS 2.0 feed. Both comments and pings are currently closed. 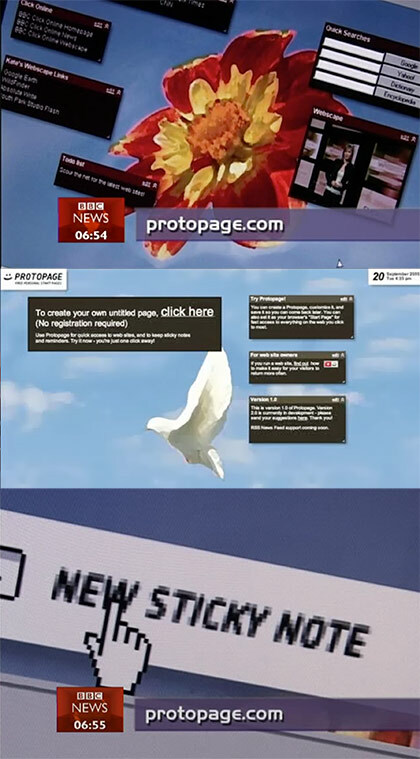 Congratulations on your 10th birthday, I can’t remember exactly when I started using Protopage but it was quite early on, may be after seeing the BBC news story. Those images do look familiar. And thank you for all the new features. Happy birthday ! :) And thanks for your work. “Protopage mobile improvements” : before update, “news” pages show just a few links in each “widget” (then a longer list when “opening” the widget), but now all links are shown on news pages, resulting in really big lists — is there a way to set a limit ? Thanks in advance. Thanks Steve. Oz – we’ve made the mobile list of headlines per page longer so that you can load the page once and not have to wait for further page loads to see the rest of the headlines. Please drop us a message on our feedback form and let us know if you think this could actually be an anti-improvement. Congrats on the decade anniversary! I’m having problems with the Tablet set up. It keeps reloading the page. I will send you a proper feedback message with the details. Wonderful! Congratulations, and thank you for all your great work!! The podcast player is VERY much appreciated. Thank you. And congratulations on outrunning iGoogle. When iGoogle died I was at a bit of a loss, but I found Protopage, found it easy to set up and personalise, and have used it every day since. So thank you for your work. Belated Birthday greetings – I found you when the BBC updated their Homepage in 2011 and except for the recent font size increase for Retina Displays, which has upset a couple of widgets (which will take a bit of tweaking but nothing major – and at least you can modify ‘your’ site), it’s been a great experience.